Although in general I have tremendous faith in science, there are a few concepts I’ve always had some trouble grasping. For example, textbooks have told us for decades—with great certainty—details about the interior of the Earth. We know how thick the crust and mantle are, what the core is made of, and how hot it is (among many other facts), even though no one has managed to dig or drill even halfway through the crust—the thinnest and outermost layer of the planet. How do people figure this stuff out? Yes, I know it’s all about earthquakes. When the ground shakes, sensitive instruments all over the world make detailed measurements. By carefully analyzing the way vibrations move from one point to another, scientists are able to infer a great deal about the planet’s structure. Although I accept that this is true, the actual physics and mathematics involved are so far beyond me that I can’t help harboring a slight doubt. Maybe the core is really made of flubber or, say, chocolate pudding, rather than iron. If I wonder at proclamations about the composition of our own planet, you can imagine how I felt when I read that astronomers are now making claims about the interior of the Sun. Not only that, these claims are based on measurements of sound, which I am reliably informed does not travel through space. After a few minutes of eye rubbing and brow furrowing, I began the long, slow process of trying to wrap my brain around the emerging science of helioseismology, the study of vibrations that occur within the Sun and what they tell us about its interior. Helioseismology is a branch of the more general science of asteroseismology, which is not limited to our Sun in particular. But as the Sun is conveniently located much closer to Earth than any other star, it gives us the best opportunity for detailed study. 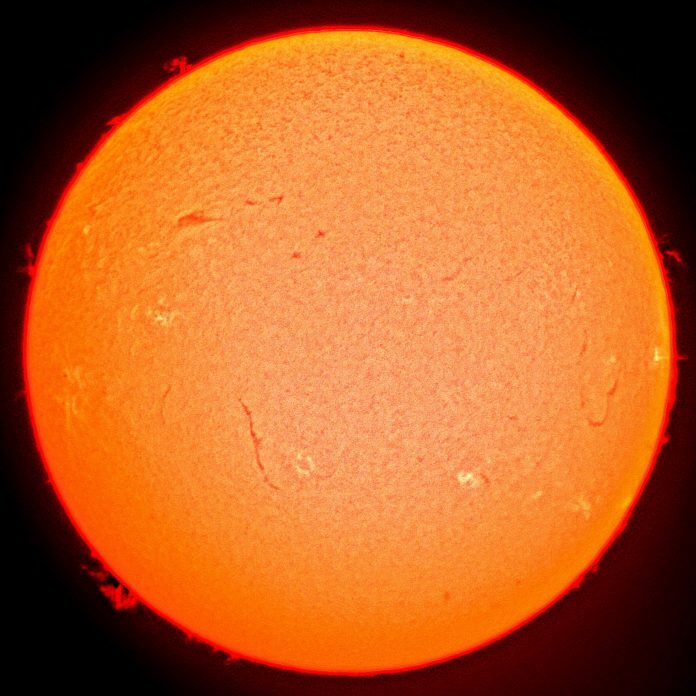 Observers have noticed periodic changes in the brightness of the Sun and other stars for centuries, but a more detailed study in 1960 showed that the Sun’s surface has an extremely complex pattern of oscillation. In 1970, astronomer Roger Ulrich theorized that the oscillations were due to sound waves traveling through the interior of the Sun. Further research in the decades that followed has confirmed that hypothesis. How exactly does one observe oscillations on the surface of the Sun? By measuring the Doppler shift of light coming from a given location on the Sun’s surface using specially designed spectrometers, astronomers can tell whether that spot is moving inward or outward, and at what rate. This data can be used to create computer models that graphically depict the waves on the surface. And this information, in turn, reveals what’s going on under the surface of the Sun. Some people liken helioseismology to a sonogram: using sound waves to “see” inside a body—in this case, a celestial body. In the case of the Sun, the vibrations are affected by temperature, density, and convection, meaning that by studying the patterns of sound waves, astronomers can create surprisingly detailed, dynamic maps of the interior of the Sun—not just its surface. Helioseismology has produced some interesting results. For example, astronomers now know that the Sun contains plasma “rivers” or “jet streams”—massive convection currents that produce what you might think of as solar cyclones thousands of miles below the surface. In addition, the research has shown that the Sun has a number of layers that rotate at different speeds, contributing to the formation of powerful magnetic fields. And helioseismology can even detect sunspots on the far side of the Sun—quite a neat trick if you think about it. All this information can help scientists evaluate theories of stellar evolution. Of more immediate practical concern, helioseismology is the best tool currently available for predicting solar weather patterns. The solar flares and coronal mass ejections that often accompany sunspots can disrupt satellites in Earth’s orbit and damage electrical grids. The more we know about the timing and location of these events, the better we can prepare and adapt. The moral of the story? Although you should never look at the Sun, you should always listen to it. Note: This is an updated version of an article that originally appeared on Interesting Thing of the Day on July 24, 2004.